Recharge towels using baking soda and vinegar. I am constantly getting great reviews and comments about the use of vinegar and baking soda to freshen funky towels. Bathroom towels that were once fluffy and absorbed water are now looking dingy. They have seen better days and could smell better too. When towels have been washed with wash products like fabric softener, the product leaves a waxy film behind on the towels. Freshen towels by following this secret recipe. Throw towels into a hot wash load. Run towels through wash cycle with 1 cup vinegar and cycle on hot water (that’s it – no laundry detergent). Run towels through a second hot wash cycle with 1/2 cup baking soda (that’s it). Thoroughly dry towels in dryer or towel line. 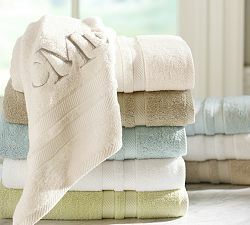 Repeat as necessary or when towels become less absorbent and/or a funky smell. Do not use detergent/softener while doing this cycle.